Heroes were much a feature one hundred years ago, whether intrepid explorers, valiant soldiers or pioneer airmen. Canine heroes too were once much vaunted in those more romantic times, when dogs were valued not for what they looked like but for what they could do. Throughout the 19th century, both the Newfoundland and the St Bernard were very much the hero-breeds. 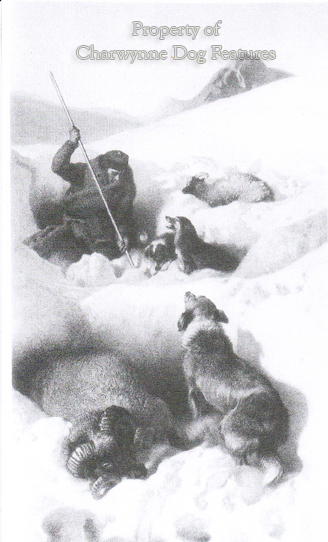 Landseer's celebrated painting "A Distinguished Member of the Humane Society" drew attention to the feats of the Newfoundland. 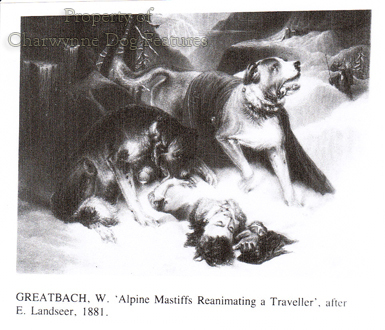 His "Alpine mastiffs re-animating a distressed traveller" of 1820 paid homage to the St Bernard. 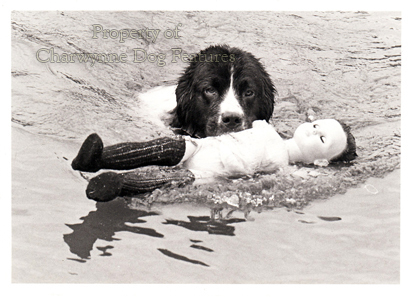 The heroism of one St Bernard, "Barry", was legendary. 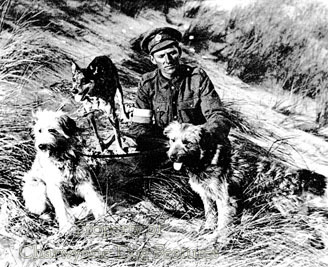 Other heroes are long forgotten, such as an Alsatian, as they were then known, Bob of Carmel, owned by Mr Elliott Durham of Northwood,Middlesex, which not only predicted his owner's car catching fire, allowing his escape, but once held his owner's collar when he fell over a cliff, thereby saving his life. This happened seventy years ago. The dog had a stumpy tail (he was descended from Noris von Kriminal Polizei, who threw this fault); how many people would have taken this dog on with such a fault? So many pure-bred dogs are valued only for their looks these days, with perfection of form rated higher than character. We are going to have to be so careful that we are not perpetuating only those dogs which can perform in the show ring but do nothing else. In previous centuries dogs were valued for what they could do rather than how they stood or moved in the show ring. Sadly too the St Bernard has lost its working role and seems to be bred for bulk rather than activity. Every depiction of a Hospice dog shows a strapping active dog, lacking carthorse bone and drooling lips. No dog with slobbering lips would last long in sub-zero temperatures. Nowadays, the mountain rescue services of the Alpine nations make great use of dogs, nearly always German Shepherd Dogs, dogs thankfully rated on what they can do not on physical beauty. We all love a handsome dog but must be careful we don't end up with just "no-brainers". In many newspapers four years ago, there was a leading story on how "Customs top dogs sniff out £50m of smuggled drugs". Apparently, a team of Customs-trained sniffer dogs, rescued from dogs' homes or donated by people unable to cope with boisterous pets, had sniffed out illegal drugs at Dover with a street value of more than £50 million. What a reward from dogs unwanted by society! The top dog of this invaluable team, a springer called Scooby, was described by his handler as "an extension of my right hand". A Customs spokesman said that inquisitiveness, coupled with intelligence and athleticism, made a good sniffer dog. Paradoxically, these three qualities are the main attributes of dogs that roam, because they can escape more cunningly, of dogs that challenge the patience of their busy owners and of dogs that want to exercise their talents, rather than sleep all day. People who are out at work all day cannot cope with dogs which are really lively, extremely curious or remarkably agile. Yet so often they choose breeds which have been specifically bred for such attributes for several centuries; mercifully, such dogs often end up in outlets like the Customs and Excise, where they are regarded as heroes. If you advertised dogs for sale which were "remarkably inquisitive, highly intelligent and extremely athletic", as the pioneer breeders in that breed desired them to be, you would be regarded with suspicion. Far safer to trot out the strangely acceptable untruth "Pups for sale, excellent pedigree". One day soon the paying public will see through the often crafty use of a worthless piece of paper as some indication of quality. More likely however, is a case with the local Trading Standards Officer, where the exposure of both a badly bred dog and a false pedigree will damage both the dog-breeding game and the many honourable breeders. We no longer set out to breed canine heroes. Perhaps the Guide Dogs for the Blind breeding programme, some sheep farmers and those police forces in the world wise enough to breed their own dogs are attempting this in a quiet way. So many service and police dogs however started off as misfits, rejects, individuals that wouldn't conform. Conformation, in both senses of the word, is rated above character in dogs today. If every lively, intelligent, inquisitive dog is either surrendered to the services or castrated by some misguided vet, we will end up with no source for canine heroes and the world will be a poorer place for that. Dogs which don't conform are like humans who don't conform: they achieve great things and carry out great deeds.